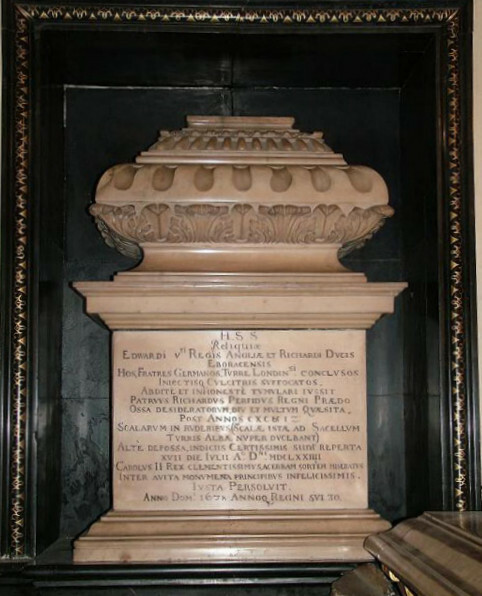 Just what or who is in that urn in Westminster Abbey….? This may be something everyone else knows but I didn’t. So I’ll post it, in case others might wonder as I do. Who or what is in the urn in Westminster Abbey, which supposedly contains the bones of the two boys known as the ‘Princes in the Tower’? So who is to say any of the remaining human bones are the original ones? Are there even any human bones? To my mind, this makes it even less likely that anything can be proved or concluded if the urn is opened and the bones get the ‘Richard III’ treatment in some university lab. And as an afterthought . . . were all the animal bones returned to the urn . . . .? What, exactly, is inside it now? To be honest, the chances of it being the remains of the illegitimate sons of Edward IV are pretty slender. The bones were discovered ten feet under a stone staircase in 1674, which makes it far more likely they predated the Tower itself. More likely they are Roman remains, with 17th century animal bones chucked in for ballast when the Wren urn was ‘filled’ in 1678. Or, of course, it has been suggested the animal bones are evidence of Roman ritual practices. Could be. Who knows? Without getting inside that pesky urn, we will never find out. Totally pointless discussion. Examining the bones will prove nothing. If they are from the princes then it’ll be impossible to prove that Richard killed them or did not kill them. If they turn out not to be the princes then Westminster Abbey have a big problem about what to do with them. Therefore they should be left where they are and those crying out for their examination should be told where to go. On the contrary, if the remains aren’t the ex-Princes then we can look for them elsewhere – Gipping, the Low Countries, near Tyburn or Eastwell. These locations would tally with them having died after Richard did, fifty years later in one case, so that those who claimed to have been one or other ex-Prince could well have been truthful. The whole More legend can then be laid to rest, even though he contradicted anyway. If they are then proper, unprejudicial, modern scientists could determine their most probable year of death. After all, Tanner and Wright’s conclusion is opposed by so many scientists who would like to access the bones. If proved not to be the princes, surely a decent quiet burial in a nearby churchyard could be arranged, and the urn itself popped into the British Museum as a curiosity. But I would sooner wait until forensic science has been further developed – until we can determine if these bones are female, for instance, and the date of their deaths be more exactly discovered. After all, it is highly unlikely – given their history on their original discovery – that any DNA can be found there. If there are teeth (and I don’t remember for sure, but seem to recall mention of some), then there is a possibility of getting DNA from them. A lot of DNA degrades over time, but apparently sometimes in teeth it is pretty well protected. So it’s possible. And even without DNA, at least carbon dating could be done. Getting to an exact time of death is really not currently feasible, as I recall, but it would certainly be possible to determine if they are, say, Roman, as opposed to 15th century. Every little bit of evidence that can be found is a piece of the puzzle, and never pointless. The bones had shreds of velvet attached to them which was only worn by royalty, as for the other animal bones mixed in with them, all that shows is after the poor souls were murdured, possibly by strangulation their bodies were treated with no reverence at all and hastily thrown in some old pit where their bones got mixed in with other old carcasses, read Mores account of Richard 111, he said the remains of Edward V and Richard Duke of York were deposited near to an old stairwell in the Tower, More had access to the nuns in the nearby minories who were in close contact with the contemporaries of the poor little Princes, and so these human remains were found in that same spot where More had said they would be, also there are the dental records that show a familial resemblance between the young Duke of York and his child bride who were related, there is overwhelming evidence that these bones in the urn are those of the tragic princes who vanished mysteriously that fatal month in August, when people disappear it generally means they are dead, they were never seen again,what further proof do Ricardians need? Of course if we have actual proof they are the sons of Edward 1V and Elizabeth Woodville some will say it does not prove Richard 111 had them murdured but given that is what happened in the medieval world when one King was deposed by the usurper, the deposed monarch always ended up dead, it would be highly unlikely that Richard would let them live, Henry V1 was murdered in the Tower to keep the throne secure for Edward 1V, therefore his two nephews would have to die also, it was the medieval mind – the way of kings, sentiment would not come into it, his throne could have no contenders and alive they posed a threat, he also had his own son to consider. We only have a workman ‘s word for that, from Charles ‘ time. These bones could be of any number, age, gender or species. Richard III was the “Princes” uncle yet has no missing teeth in that way. Anne Mowbray was a distant cousin yet she shared the pattern and you don’t resemble someone just because you marry them. Anne was the niece of Lady Eleanor Talbot whose father was identified after death by a congenital missing tooth. Furthermore, these remains have not been subjected to radio carbon dating or DNA analysis yet we now know the mtDNA of the nephews through an all-female line traced to Elizabeth Roberts, thanks to John Ashdown-hill, who also found Richard ‘s mtDNA and identified him as well as providing the dental evidence cited above. So we will be able to verify those remains properly as soon as we can “Open the Box”. They are unlikely to be the “Princes “, but now we can find out for certain. I won’t get into ‘who did it’ (if anyone did) here but the bones from the Tower are unlikely to be theirs. They are from an ancient layer 10 feet deep, and the entire site is on top of a Roman Basilica with a Roman cemetery a few hundred yards away at the Minories. They are unsexed (and actually the elder is believed to have some female characteristics) and undated.A child’s skeleton of similar age was found at the Tower in the 70’s, and turned out to be Iron Age when carbon-dated. I expect these are the same, my suspicion from an archaeological perspective is that the bones were in a Roman or Iron Age midden, hence the animal bones and other detritus found with them. Regarding the teeth-hypodontia has a slight female bias generally and may well come from the maternal side in Anne Mowbray’s case. Certainly Richard III does not have it. There was also some question about possible tooth loss in the Tower skeletons being peri-or post mortem rather than ‘never there’; one jaw was very badly preserved. one of the sailors on the ‘Mary Rose’ had congenitally missing teeth. Was he one of the princes? or even related to the royal family? or the Mowbrays? Carbon dating first, then, if that shows they could be the princes, DNA testing to fine out if they truly are. Quite. Anne Mowbray shared the defect with her maternal grandfather. After Castillon, a herald thrust a finger into his mouth. She and Richard of Shrewsbury shared Edward I as their most recent common ancestor, as she did with Edward V and Richard III. The first Earl of Shrewsbury, a sort of mediaeval Terry-thomas, may be even more distantly related to his grandson-in-law. BTW, my own DNA profile showed markers for congenitally missing teeth. Off topic – but who or what has been monkeying (excuse it, please) with this site? I used to be able to reach it by typing in ‘murrey and blue” then I had to go to one of the counting sites and approach it via the back door. Now I am led to a bunch of sites in Chinese or Korean, and it takes six or seven clicks to do what I used to be able to do in one, or at most, two. Have I been hacked by the Russians? Bishop Morton? party or parties unknown? Or has this site? 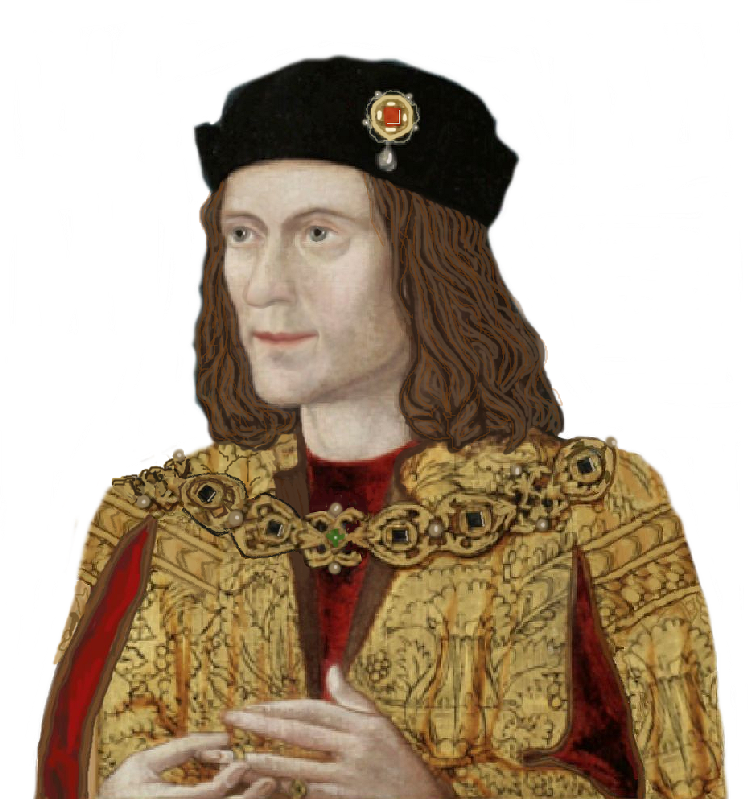 Just occurred to me – maybe it was Henry vII’s pet monkey? Destructive little critter.